Machine & Fabrication Shop - Columbia Steel Casting Co., Inc.
Our machine shop is the largest specialized metalworking center of its kind on the West Coast. 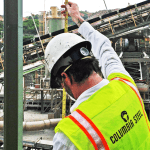 Columbia Engineering Works (CEW) is our on-site machining and fabrication facility created to finish Columbia Steel castings, manufacture our fabrications, and to be a full service center for industrial components. CEW combines facilities and experience in a one-stop location, freeing customers from coordinating different contractors and shuttling projects from shop to shop. We undertake a wide range of projects requiring iron or steel casting, fabrication, finishing and heat treating. CEW also offers service on complete assembled subcomponents with interference fitting and advanced tool machining on high hardness materials, including martensitic cast iron. Our shop combines heavy fabrication work with ferrous castings, weld assembled, stress relieved, machined and quality assured by non-destructive testing to the highest industry specifications. Let us meet your large-scale manufacturing challenges.